I went on a date with myself on Monday at The Hollow Bar + Kitchen for Downtown Albany Restaurant Week and I have to say it was a good start. Last month, owner Mike Phillip announced his plans to rebrand The Bayou Cafe at 79 North Pearl Street and make food a new focus, and from the small crowd stepping in on a Monday night, people have been receptive to the idea. The Hollow, which sits at the foot of Sheridan Hollow, is previewing its new menu and new space this week for Restaurant Week and rolls out a full menu next week. The Restaurant Week menu is promising and worth a look, and Mike has done a beautiful job of transforming the Bayou dining room with exposed brick walls and black tablecloths bathed in light from a chandelier of mason jars. My only concern is that, with the attention the dining room has received, the space seems incongruous with the bar and back room, both drab in the early evening light, and in need of an update to fit with the new concept. I started my evening at the bar with a Victory HopDevil IPA (Downington, Pennsylvania), which along with Peak Organic IPA (Portland, Maine), was the best beer on tap, as Ithaca Flower Power IPA (Ithaca, New York) had been kicked. I was disappointed drinking craft beer from a Bud Light pint glass, and I am sure I am not alone in this, but I’ll try not to hold it against The Hollow for now. 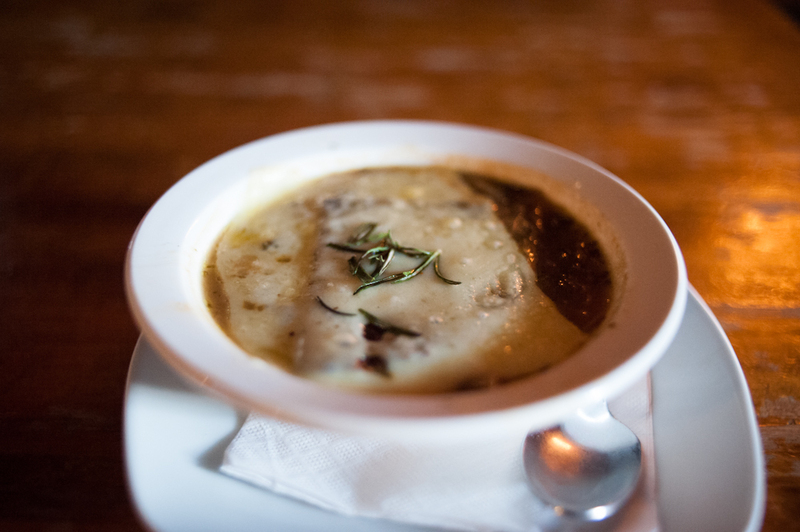 My first course was delicious, a baked spring onion soup, with a vegetable broth of melted spring onions, kale, and Bass ale, topped with a pumpernickel crouton, swiss cheese, and sprigs of rosemary. The oversize pumpernickel crouton was perfect between the soup and cheese, though I could have done without the kale stalks which I found reedy. 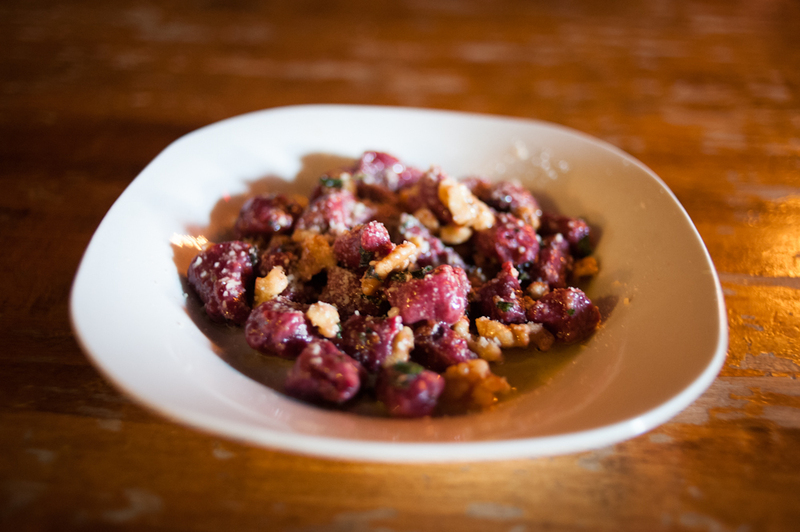 I continued with beet gnocchi with fried sage leaves and toasted walnuts in a brown butter sauce. While the dish was not as flavorful as I expected, the color of the gnocchi was just right and the the walnuts were a nice touch. Drawing attention, eating alone, camera in tow, Mike brought over a grass-fed braised beef short rib for me to try. Served with carrot, onion, and herbs, over mashed Yukon Gold potatoes, the dish should prove to be a hit. 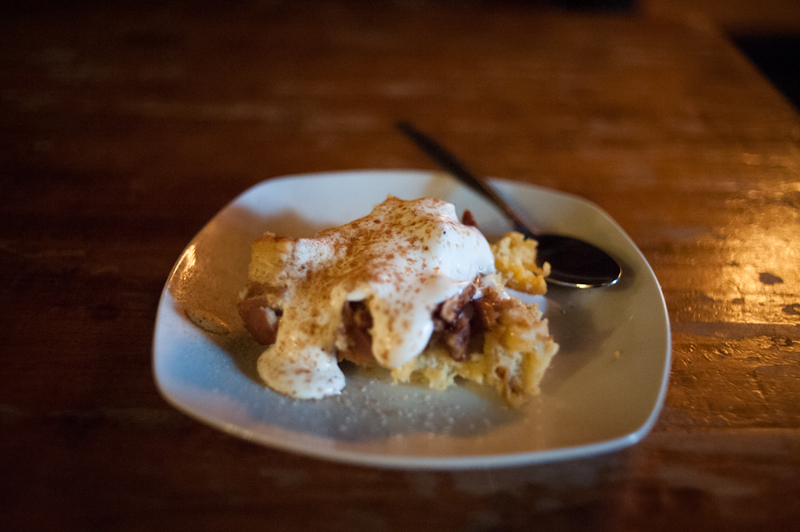 I finished the evening with a well-balanced bread pudding (custard-soaked brioche, pure New York maple syrup, toasted pecans, and house-whipped cream), happy with my server, Alysia, happy with my visit, and optimistic for The Hollow. Downtown Albany Restaurant Week runs through April 26th and is $20.13 well spent, regardless of where you eat. 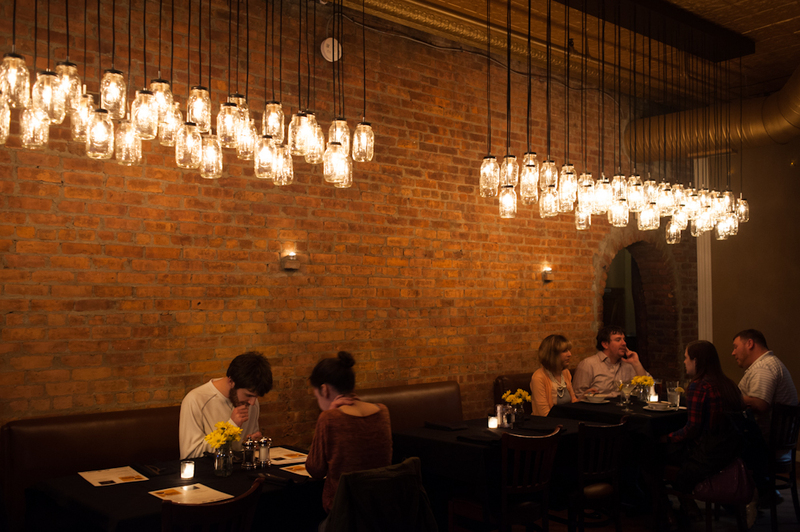 The Hollow Bar + Kitchen (518-462-9033) is open Monday through Friday, 11:30 a.m. to close, and Saturday from 4:00 p.m. to close.